During August–September 2000 a salvage excavation was conducted south of the Kathisma Church (Permit No. A-3276; HA–ESI 113) following the paving of a road. The excavation, on behalf of the Antiquities Authority and financed by the Ministry of Construction and Housing, was directed by R. Avner, with the assistance of V. Essman and V. Pirsky (surveying), R. Abu Khalaf (administration), and N. Zak and I. Berin (drafting). The Kathisma church is delineated by an ancient road, flanked by two parallel terraces on the south, and by a terrace on the west. Expanding the modern road caused damage to the ancient road, the two southern terraces and particularly the corner formed by the western terrace and the southern terraces. The excavation (Area D) examined the sections of the damaged road and terraces; a square was also opened next to the open ‘Bir Qadismu’ water reservoir. The exposed remains were ascribed to two phases of the Byzantine period and to three strata (I–III), dating to the Ottoman period and the Middle Ages. Stratum I. The three terraces were attributed to this stratum. They were built of two rows of different sized stones with a fill of earth and small stones between them. The western terrace was revealed over a length of 8.3 m and was 1.5 m wide. Its western face was built of medium and large stones that were coarsely dressed; one of them had drafted margins. The western terrace was preserved to a maximum of four courses high and the southern terraces were preserved to three courses high. This stratum was attributed to the Ottoman period, based on ceramic finds that were discovered on surface. Stratum II. A stone-slab pavement was found below the eastern face of the western terrace. A larger section of the pavement that was incorporated in the top of a wall (W611 of Stratum III) was discerned close to the southern end of the terrace. Remains of a pavement (L631) ascribed to Stratum II were recorded in the square adjacent to the ‘Bir Qadismu’. A pavement similar to this one was uncovered south of the church and was dated to the Middle Ages, thus assigning Stratum II to this period. Stratum III. Two walls (W616, W617; width 0.45–0.55 m) from the Byzantine period were incorporated into the construction of the western terrace at its northern end. Wall 616 (length 0.65 m) continued the line of the northern terrace and Wall 617 (length 0.95 m), oriented east–west, was perpendicular to W616. The walls were built of two rows of medium-sized stones and were preserved a single course high. The eastern face of W616 and the northern face of W617 were coated with pink plaster that included pottery chips and was characteristic of the Kathisma site in the Byzantine period. A white mosaic segment (0.23 × 0.40 m; size of tesserae 1.7 × 2.0 cm) that may be part of an installation abutted W617 on the north. At the southern end of the western terrace and parallel to W617 was a section of Wall 611 (width 0.55 m), aligned east–west and preserved for a length of 3.2 m. The western part of the wall was covered by the terrace. Sections of a crushed chalk floor (L626) that abutted W611 on the north were discovered south of W617. Remains of an installation, probably set on this floor, were detected some 3 m south of W617. They included a rectangular stone (0.32 × 0.48 m) with a square recess (0.12 × 0.14 m, depth 6 cm) in its center, wherein an iron handle that may have been attached to a well's lid, was found. The stone was probably enclosed within a built circle of stones, of which three stones survived on the southern side. The function of this installation is unclear. 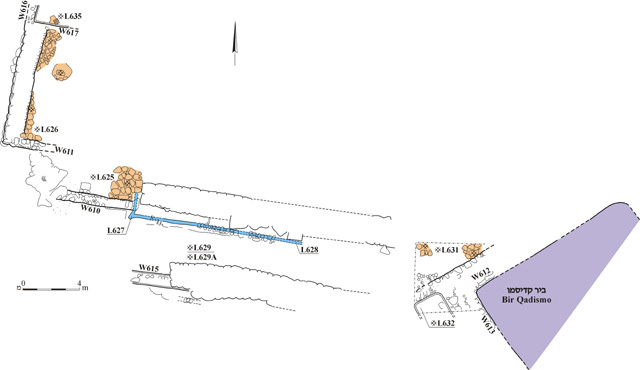 Two walls (W610 and W615) from the Byzantine period were found below each of the southern terraces. The two walls were built of two rows of medium and large stones with gray plaster between them and were preserved a single course high. Wall 615 (width 0.66 m) was exposed for a length of 4.25 m; the eastern stone of a door threshold was preserved (reconstructed width 1.2 m, depth 0.63 m) in W610 (length 15.7 m, width 0.7 m), having high margins (width 0.18 m, height 7 cm) and a socket (diam. 7 cm, depth 4 cm) for the door pivot. A step led from the threshold to a stone-slab floor (L625) that abutted W610. A channel (L627, L628) coated with pink plaster mixed with pottery chips was adjacent to the southern side of W610. The channel was preserved for a length of 11.2 m and the stone-slab covering was preserved in its eastern part, which was 6 m long. A crushed-chalk floor (L629) abutted the channel on the south, next to the threshold in W610. Some 0.35 m below Floor 629 was an earlier crushed chalk floor (L629A). The square opened next to the northwestern corner of the ‘Bir Qadismu’ reservoir included a wall (W612) that was part of the northern reservoir wall. The wall, preserved a single course high, was built of two rows of medium-sized stones with gray plaster between them. An installation (L632; width 1.4 m) just south of W612, in the southwestern corner of the square was coated with gray plaster mixed with a few pottery chips. The installation was probably used for storing water and was preserved to a maximum of 0.35 m high. A wall (W613) between ‘Bir Qadismu’ and L632 was coated with a layer of plaster on its western face and was probably a segment of the reservoir’s western wall. 1. The Kathisma Church. Plan.